Celtic continued their defence of the Scottish League Cup by seeing off the doughty challenge of Raith Rovers. The Championship side were never overwhelmed but Celtic bossed the game and opened the scoring through Kris Commons. The Kirkcaldy side were game enough to create some half-chances, even if Celtic dominated possession. 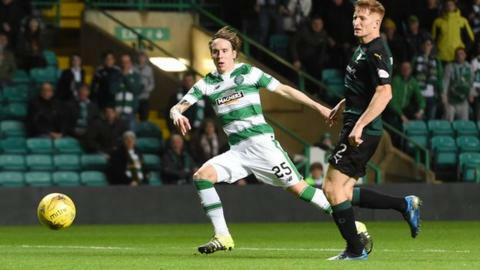 It took until late on for a second goal, from Stefan Johansen on the counter attack. Patience had to be the cornerstone of Celtic's display. The visitors were resolutely well organised and determined to restrict Celtic's attacking progress. That often left Craig Wighton isolated in the lone striker's role. He was not entirely excluded from the flow of the game, though, and was sharply aware of the possibilities as Grant Anderson leapt to flick on a high ball. Wighton ran onto it, drove into the penalty area and drew a shot across goal that Craig Gordon had to move smartly to push away. That kind of adventure might not have been at the forefront of the Raith players' minds, since they were set up to deny Celtic. Celtic enjoyed plenty of possession and moved the ball around the field with casual precision but the play lacked a spark of dynamism. The pattern might have provoked Commons. When he received the ball from Callum McGregor 20 yards out, he took one touch to shift it onto his left foot then arrowed a shot into the bottom corner of the net. It was a moment of brutal aplomb and reminded again of the worth of Commons - a mercurial figure capable of great and decisive skill but not always with the application Deila demands - when games are so tight and deadlocked. Commons, who scored when there appeared to be little danger, tends to perform in bursts. There was more sustained impressiveness from Kieran Tierney, the 18-year-old playing at left-back. He was self-assured, sound and always prepared to take his direct opponent on. The confidence was welcome, because it often sparked an intrepid moment. At one stage in the first half, he burst into the Raith penalty area and only a lunging block from Kyle Benedictus prevented his shot reaching the target. Celtic would have benefitted from a greater edge to their play. When they were awarded a free-kick on the edge of the 'D' just before the interval, Nadir Ciftci strolled up before wafting an effort over the bar. The nonchalance seemed symptomatic. The home defence lacked poise when a long throw reached the penalty area, and the ball dropped to Ross Matthews. Leaping to meet it, the 19-year-old midfielder could only poke his volley over. James Craigen tried his luck from distance - with Gordon saving comfortably - and Scott Brown found Gary MacKay-Steven inside the area at the other end but he steered his shot wide. James Forrest, too, made an effort to add to the scoreline but his effort curled just wide. His fellow substitute Tom Rogic screwed another chance wide but there was never any sense of alarm for Celtic. Another moment of fine individualism added some gloss to the scoreline when Johansen dinked the ball past Benedictus at the halfway line, surged upfield and then calmly clipped the ball into the far corner. It was, then, job done. Match ends, Celtic 2, Raith Rovers 0. Second Half ends, Celtic 2, Raith Rovers 0. Attempt missed. Tomas Rogic (Celtic) left footed shot from outside the box is close, but misses the top left corner. Substitution, Celtic. Aidan Nesbitt replaces Nadir Ciftci. Goal! Celtic 2, Raith Rovers 0. Stefan Johansen (Celtic) left footed shot from the centre of the box to the bottom left corner. Assisted by Saidy Janko. Attempt blocked. Nadir Ciftci (Celtic) right footed shot from the centre of the box is blocked. Foul by Nadir Ciftci (Celtic). Lewis Toshney (Raith Rovers) wins a free kick on the left wing. Attempt missed. Ryan McCord (Raith Rovers) right footed shot from outside the box is too high. Attempt missed. Jon Daly (Raith Rovers) right footed shot from the left side of the box is just a bit too high. Attempt missed. Tomas Rogic (Celtic) right footed shot from the centre of the box is close, but misses to the right. Substitution, Raith Rovers. Ryan McCord replaces Ross Matthews. Substitution, Raith Rovers. Mitchel Megginson replaces Grant Anderson. Attempt missed. James Forrest (Celtic) right footed shot from outside the box is close, but misses to the left. Attempt saved. Gary Mackay-Steven (Celtic) left footed shot from the right side of the box is saved in the top left corner. Attempt missed. Efe Ambrose (Celtic) header from the centre of the box misses to the right. Corner, Celtic. Conceded by Jason Thomson. Substitution, Raith Rovers. Jon Daly replaces Iain Davidson. Attempt saved. Efe Ambrose (Celtic) header from the centre of the box is saved in the top right corner. Corner, Celtic. Conceded by Lewis Toshney. Attempt blocked. Gary Mackay-Steven (Celtic) left footed shot from the centre of the box is blocked. Attempt missed. Nadir Ciftci (Celtic) header from the centre of the box is high and wide to the left. Substitution, Celtic. Tomas Rogic replaces Kris Commons. Attempt saved. James Craigen (Raith Rovers) left footed shot from outside the box is saved in the centre of the goal. Corner, Celtic. Conceded by Rory McKeown. Attempt missed. Stefan Johansen (Celtic) left footed shot from outside the box is high and wide to the left. Attempt missed. Ross Matthews (Raith Rovers) right footed shot from the centre of the box is just a bit too high.